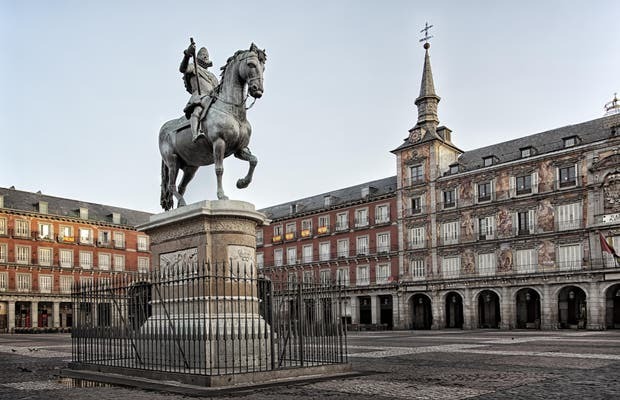 The Plaza Mayor of Madrid might be the most emblematic place in the capital, justifiably. Most of the old Spanish cities have a Plaza Mayor, but the one in Madrid is especially beautiful. Dominated by an equestrian statue and the hundreds of tourists accumulating next to it, the colors, the beauty and the constant movement year after year, give a special value to the square.It is the ideal place to go have tapas or a beer, as well as one of the traditional "bocadillos de calamares" (fried octopus sandwich). I highly recommend this place that you can't miss out on if you visit Madrid. It is quite hard to choose which of the small streets you should take to get to Plaza Mayor, emblem of the so-called Madrid de los Austrias. I loved the passage of San Ginés, where you can find the wonderful Chocolatería founded in 1890. The Postas street is also something: it has the Posada del Peine, the oldest accommodation in Madrid, closed after four centuries and now turned into a high-tech hotel. The craftsmen used to work around the square, in Bordadores, Esparteros and Cuchilleros streets. Plaza Mayor was the main market since the 15th century. Enclosed on all four sides, the square housed two of the most important professions: the butchers and the bakers. Any day of the year, at any time, there is no better place to meet someone than Plaza Mayor. Here is where we start our visit of the Madrid of the Habsburgs today. Starting at the place first called Plaza del Arrabal can be somewhat dangerous: we don’t want to leave; we’d rather stay in this small, warm and lovely world, surrounded by endless arcades. This is how it was conceived when, without bragging, the world was Spain and Spain was Plaza Mayor. This inclusion almost mystical started in the head of its promoter, Felipe II and his first architect's, Juan de Herrera; it is the year 1561. Since then it stayed the same, despite all the changes by some of the best architects: Diego de Sillero, Juan Gómez de Mora, Sabatini, Juan de Villanueva, in 1590, 1619, 1790, 1854. Plaza Mayor is one of Madrid’s most charming places, at least for me. I love just walking around the area and exploring the smaller streets around the square. If the weather abides, you can have a drink in one of the square’s terraces. You can also try a to-die-for calamari sandwich, which is something very typical of Plaza Mayor. At Christmas time, the square fills up with vendors selling ornaments, wigs, hats, or gag gifts for dia de los santos inocentes (a Spanish holiday similar to April Fool’s Day). I remember I got really excited when I was living abroad and I was watching a video of “WheretheHellisMatt?” and I saw Plaza Mayor in one of the funniest moments. Located very close to Puerta del Sol, it is full of terraces year long (be careful about what you buy there, you can spend half your salary). The construction of the three-floor buildings is harmonious and the equestrian statue of Felipe III really stands out. They say bullfights and auto-da-fé were celebrated there but I will personally remember what it has to offer during Christmas nowadays, when the square gets full of stands selling all types of small figures for the nativity scene, the Christmas tree or to get dressed during those days. They also put a carousel delighting children.